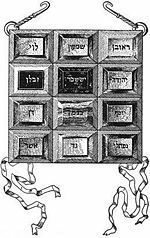 The breastplate of Judgment (Hebrew: חושן משפט, Choshen Mishpat) also known as the priestly breastplate was a sacred breastplate worn by the the High Priest for the Israelites (Hebrew: כהן גדול, Kōhēn Gāḏōl), according to the Book of Exodus. In the biblical account, the breastplate is termed the breastplate of judgement, because the Urim and Thummim, by which the High Priest checked the will of God in any important matter that would affect the nation, were placed within it (Exodus 28:15 ). Breastplate of the Jewish Kohen ha-Gadol (High Priest). Unfortunately, the meaning of the Hebrew names for the precious stones, given by Masoretic text, are not clear, and despite the names appearing in Septuagint be clearer, scholars believe that they can not be considered absolutely on this matter, because the breastplate had ceased to be in use by the time the Septuagint was written, and several Greek names for various gemstones changed meaning between the classical era and modern times. Hebrew: אֹ֤דֶם, Odem (in the masoretic text) / Greek: σάρδιον, Sardios (in the Septuagint) - both names mean red. Probably refers to Sard. Josephus says Sardonyx (Ant. iii, 7, 6). Odem might also refer to Carnelian, which was flesh-coloured, or to red Jasper. Hebrew: פִּטְדָה֙, Pit'dah (in the masoretic text) / Greek: τοπάζιον, Topazios (in the Septuagint) - The Septuagint mention the Topaz, but the gem can be the Chrysolite. Job said that wisdom is more valuable than the pètdah of Cush (Job 28:19 ). Hebrew: בָרֶ֔קֶת, Bareket (in the masoretic text) / Greek: σμάραγδος, Smaragdos (in the Septuagint) - It can be Heliodor. It also can be Rock crystal or Emerald. Hebrew: נֹ֥פֶךְ, Nofekh (in the masoretic text) / Greek: ἄνθραξ, Anthrax (in the Septuagint) - It can be the Carbuncle (according to Vulgate), Malachite or Turquoise. Some mention the Emerald. But a red stone obviously is not an emerald. It can be either a Ruby or Garnet. Hebrew: סַפִּ֖יר, Sapir (in the masoretic text) / Greek: σάπφειρος, Sapphiros (in the Septuagint) - despite appearing to refer to Sapphire it can be the hyacinth or of jacinth. Another candidate, described by Pliny, is Lapis lazuli (Ultramarine). According to Wycliffe Bible Commentary it is more likely to be the Lapis lazuli. Hebrew: וְיָהֲלֹֽם, Yahalom (in the masoretic text) / Greek: ἴασπις, Iaspis (in the Septuagint) - A few scholars have suggested that Yahalom may refer to diamonds. Some believe the stone to be the Sardonyx. There is no evidence that diamond was known in ancient days. Hebrew: לֶ֥שֶׁם, Leshem (in the masoretic text) / Greek: λιγύριον, Ligurios (in the Septuagint) - Pliny described the Ligurios as having certain electrical properties, which a number of scholars have taken to imply that it referred to Amber. Some believe that it was the Agate, others supposed that was the Jacinth and yet others believe that it was the Opal or Amethyst. According to Wycliffe Bible Commentary it was either Jacinth or Cairngorm. Hebrew: שְׁבֹ֖ו, Shevo (in the masoretic text) / Greek: ἀχάτης, Achates (in the Septuagint) - Achates surely refers to Agate. Named from the river Achates, Sicily first discovered by the Greeks. A red opaque stone. Hebrew: אַחְלָֽמָה, Ahlamah (in the masoretic text) / Greek: ἀμέθυστος, Amethystos (in the Septuagint) - Amethystos refers to Amethyst. Hebrew: תַּרְשִׁ֥ישׁ, Tarshish (in the masoretic text) / Greek: χρυσόλιθος, Chrysolithos or in other places Greek: ἄνθραξ, Anthrax (meaning Coal) (in the Septuagint) - Tarshish is thought by scholars to refer to Tarshish. Chrysolithos could refer to Lapis lazuli or it could refer to Topaz, Amber or Beryl. Possibly yellow Jasper. Hebrew: שֹׁ֖הַם, Shoham (in the masoretic text) / Greek: βηρύλλιον, Beryllios or in other places Greek: ὀνύχιον, Onychion (in the Septuagint) - Beryllios refers to Beryl but Onychion refers to Onyx. It can also be the Malachite according to some scholars. Hebrew: יָשְׁפֵ֑ה, Yashfeh (in the masoretic text) / Greek: ὀνύχιον, Onychion (in the Septuagint) - The Septuagint's Onychion is the Greek term for Onyx, Onyx. The jewel is variously identified as a ruby, as a hyacinth or as an Emerald. According to Wycliffe Bible Commentary it can also be the green Jasper. ↑ Douglas, J.D. ; Tenney, Merril C, ed. (1987). The New International Dictionary of the Bible. Grand Rapids, Michigan: Zondervan Publishing House. p. 1044-1045. ISBN 0-310-33190-0. ↑ Birnbaum, Philip (1979). Encyclopedia of Jewish Concepts (Revised edition ed.). Brooklyn, New York: Hebrew Publishing Company. p. 236. ISBN 0-88482930-8. ↑ Unger, Merrill F (1988). Harrison, R. K.. ed. The New Unger´s Bible Dictionary. Chicago: Moody Press. pp. 1030. ISBN 0-8024-9037-9. ↑ 4.0 4.1 4.2 4.3 4.4 4.5 4.6 Smith, William (1979). Smith´s Bible Dictionary. Nashville: Holman Bible Publishers. p. 251. ISBN 0-87981-033-5. ↑ 5.0 5.1 5.2 5.3 5.4 5.5 5.6 5.7 5.8 5.9 Pfeiffer, Charles P.; Harrison, Everett F, ed. (1962). The Wycliffe Bible Commentary. Chicago: Moody Press. p. 78. ISBN 0-8024-9695-4. This page was last modified on 2 April 2013, at 12:50.